This week I have something exciting in store — a non-science person answers my multitude of questions. Camera shy Sophia, hard at work in her office. Sophia McKay is currently the publicity manager for Genetics Otago (GO) and has been with us now for almost 2 years. She has a most exciting and varied background including University study, teaching ESL (English as a Second Language) in Hong Kong and Japan, modelling, and managing restaurants — all before returning to NZ and living in Queenstown, managing Gibbston Valley winery. After the winery Sophia managed exclusive luxury lodges (we’re talking helipads and pilots, ironed undies and about USD$20k/week charges here people) and when finally sick of playing sycophant to wealthy tourists she got a job at a design studio, was encouraged to start painting and eventually held an exhibition where she sold every piece within 2 days. At this point she moved to Mexico for a year to continue painting, and eventually held another successful exhibition. One of Sophia’s beautiful artworks. Upon returning to New Zealand for the second time, Sophia started working at Aoraki Polytech as marketing manager, had a couple of years ‘off’ after having two babies, worked at Otago’s School of PhysEd for 2 further years and finally, finally got the job with Genetics Otago — the interview for which the esteemed Director apparently commented on liking the fact that Sophia could both organise a function for 200 people and design the publicity material at the same time. She tells me all of her disparate jobs and various life experiences have served her well in the position so far, and of this I have no doubt. Sophia’s current job with Genetics Otago consisted of various set-up activities in the first year – all about branding, corralling members (160+), developing the website and quarterly newsletter, and then organising the big launch- at which Prof.’s Spencer and Gluckman gave guest talks. Since the launch Sophia has organised various symposiums and has been working on forming further collaborations and partnerships with key organisations; assisting with the New Zealand Science Festival, organising the Psychology/Genetics Meeting, instigating and assisting with the coordination of an exhibition on genetics at the Otago Museum; branding, publicising and organising the Southern Science Series (where GO speakers travel around the South Island giving talks to small communities). Sophia is also currently mid-process in designing a high-end booklet showcasing some of GO’s key members research, and finally, finally putting together a Black Tie event for charity. In her spare time, Sophia also develops all the Genetics Teaching Programme’s publicity material. 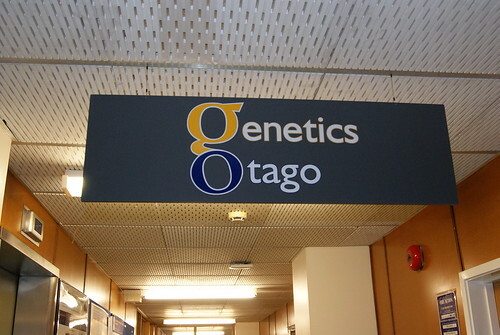 The Genetics Otago offices can be found within the Department of Biochemistry, at the road-end of the first floor. The Genetics Otago Banner, a Sophia McKay design. You would be silly to think this an exhaustive list – there are things on the fire that I have no doubt will be awesome, and keep us on our toes for the months ahead. Um. As I am surrounded with Mac users, can we write PC in the smallest font possible here? Nope — big font, I’m all about the PC. I remember when I left Phys Ed, one of the researchers over there said to me, “I hope you know what you’re getting into Soph – those genetics people are hard arse scientists…” so yes, this is my first real immersion into science. My eyes were nearly bugging out of my head as I tried to make sense of the material I was first given to decipher into user friendly text for the website. You may laugh but as a complete layperson it was incredibly difficult to distinguish between a developmental and an evolutionary researcher! But I can happily say that after 20 months in the job I’m now finding it much easier to understand. The people – I am constantly amazed at the human resources here at Otago University. Oh, and the fact that I get to vent my creative side on a regular basis and I have a fantastic boss who doesn’t care which hours I work, as long as I get the job done. How hard is it to liaise between ‘scientists’ and the public? I find most of the scientists I work with are very keen to get their message across to a general audience, however there is still the general layperson’s perception (or perhaps misconception is a better word) that these scientists are inaccessible, particularly on an intellectual level. Obviously there’s a gap there that needs to be bridged and I’m doing my best to bridge it!. How much is the writing changed/adapted for a public audience? Quite a lot! But I do have to be very careful to make sure I don’t lose the core message along the way. Do you think we should be teaching our undergrads to communicate science effectively? Absolutely – if there’s one thing I’ve learned in this job it’s how essential funding is, so if you’re wanting the support of the public and policy makers then it’s vital that you are able to communicate your work in a clear, measured, and I hate to say it, engaging manner. At what point is the ability to think like a layman lost?! Professors were undergrads at one point – and acting like children. What happens to cause the ability to think ‘normally’ to be lost? Hmmm. I think the term ‘to think normally’ is subjective for we all have our version of what is ‘normal’, however having worked with these researchers, and having come to understand how important their work is, I think I now have a small appreciation as to why they would become so immersed in their work – for the realms of discovery are infinite. What do you think of the current level/state of science communication to the public in NZ? Could do better (and I’m talking about the media here – not the scientists). Should scientists talk about their science to the public more often? Absolutely – as a non-scientist I am absolutely fascinated with what’s being discovered on a daily basis and I believe every other layperson would be too – if only it were more accessible. This is exactly why GO is trying to do things like showcase our researchers in a user-friendly format such as an exhibition. What do you think of the level of science taught in our secondary schools? Primary? Honestly? I have very little idea… my two boys are at primary level and from what I’ve seen there’s very little science being taught with the exception of environmental projects… What I do know is that all the science teachers I have come across at an intermediate and secondary level are VERY keen to have our researchers come to their classrooms so we’ve got to make the most of that. Has being closely involved with researchers changed your opinion of them, or science research in general? Completely. Even the small amount I now understand about the research that’s going on here has opened a whole new world for me. Some days my head literally hurts with the amount of information I have garnered, but I have always been of the opinion that when you stop learning in your job then it’s time to move on. I doubt that would ever happen in this position for I have gone from being entirely (and in hindsight, shamefully) ignorant of scientific research to now being completely passionate about getting all the excellent work that is being done here, out into the public domain. If you could change one thing about how our undergrads are taught, what would you change? With the advent of text/FB/twitter I know we’re in the age of casual communications, however having just waded through 50+ undergrad CVs and applications I would have to say that with the likelihood of these students having to apply for a job at some stage in their lives, I would like to see undergrads being taught the basics of how to write a letter of application and how to present their CVs in a professional manner. What is your general opinion of Otago Uni and Dunedin? Every day I count my blessings that I am able to work in such an amazing place, with all these ridiculously intelligent people and to live in this great little city. I am super admiring of Sophia’s abilities and drive — she manages to both *not* get exasperated with the (remarkably brilliant) academics and still manage to public-ify research information without losing any of the gist or excitement contained therein. From my perspective, it has been brilliant seeing someone work in the field with a remarkably different and diverse background — research science can become a big part of anyone’s life with little warning. Sophia brings the design and creative aspect of her job into our day to day lives — GO promotional material, t shirts, banners, and looking generally fabulous every day; that element of style which is usually completely absent from scientific departments. I have mentioned previously about how scientists are swayed by the same advertising strategies as the general population — bright colours, eye catching graphics and free giveaways — the same things that entice you to buy that new shampoo or breakfast cereal. Bringing that aspect of design into publicising our science is a most logical step and brings you to view your work in a new dimension — as the public sees it for the first time. I’ve said before, and I will say again (and you definitely know, right?) that all scientists are not truly as they are stereotypically portrayed — style-less, squinting, antisocial hermits (I have never needed glasses and have close to perfect vision. So there. Bowties, however, are cool.). That said, having someone with Sophia’s design background and unique outlook, in close quarters, is rare and a refreshing change. Keep your eyes peeled for the next event to come out of Sophia’s little den of brilliance in the Genetics Otago offices.